The father of a man murdered by loyalist paramilitaries has launched a legal challenge to Brexit. 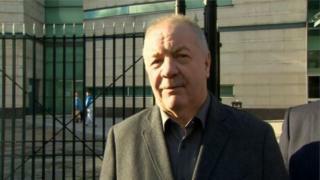 Raymond McCord is seeking a judicial review and lodged the papers at the High Court in Belfast on Thursday. Mr McCord became involved with the rights of victims of the Troubles after his son was murdered. His legal team claim it would be unlawful to begin the formal process of the UK leaving the EU without a parliamentary vote. They also claim it could undermine the UK's treaty obligations under the 1998 Good Friday Agreement and the peace process. It is the first challenge of its kind in Northern Ireland. With similar legal action already under way in England, efforts are being made to secure an initial court hearing in Belfast next week. Mr McCord's son Raymond Jr was beaten to death by the Ulster Volunteer Force in north Belfast in 1997. His body was dumped in a quarry. Mr McCord is concerned that money from the European Union, which goes towards victims of the Troubles, may be discontinued. His lawyer said there are fears that Brexit could impact on Mr McCord's fundamental rights. "As a victim of the most recent conflict in Northern Ireland, Mr McCord is very concerned about the profoundly damaging effect that a unilateral withdrawal of the UK from the EU will have upon the ongoing relative stability in Northern Ireland," he said.